I TOOK THIS OFF OF SIKH SANGAT. Darbar Sahib Complex in the climax of their genocidal campaign against Sikhs. those who are unaware of the events that occurred exactly 23 years ago. That link is old and stale by now. 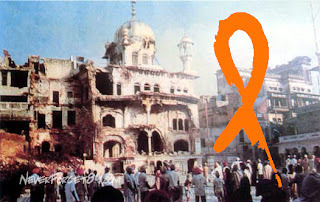 The picture is at the top of this post, the burnt out Akaal Takht with the saffron ribbon. You are welcome to do a copy/paste if you want to use it.